Telar offers a complete selection of new barrels, many in stock for immediate shipment. Our barrels meet the strictest manufacturing requirements and we will provide expert assistance to help you choose the best barrel for your application. We have the industry’s lowest prices and a huge inventory of barrels for immediate shipment. Composition: Tungsten carbide particles dispersed in a corrosion resistant chromium nickel alloy matrix. This barrel offers both abrasive wear and corrosion resistance. Essential for molding resins with 30% or more of glass fillers or mineral fillers. Carbide barrels liners include Xaloy X-800, Wexco 777 and Reiloy R215. Composition: A nickel-chrome alloy liner with boron and silicon hardening agents. This barrel offers some abrasive wear resistance and is used primarily for non corrosive resins. Can handle 10-20% glass filled resins. Standard bimetallic liners include Xaloy 102 and Wexco 666. Composition: Tool Steel cylinders consist of a sleeve of abrasion resistant material for wear resistance. 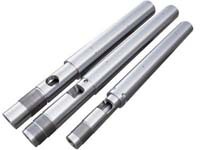 Depending on the resin we can provide either 10V tool steel which is manufactured with 10% Crucible vanadium carbide or D2 steel for general purpose applications.